The great Warren Buffet sees the wisdom in investing in single-family homes over apartment units – and here are some reasons why. As you think about investing in Arizona real estate, it may be tempting to consider multiple-unit properties. The thinking is that to scale a multi-family unit provides a bigger bang for the buck. When you weigh the pros and cons, however, you may change your views. Here are five BIG factors to consider when you decide to become a real estate investor in the Phoenix area. The fact is that tenants of single-family homes may stay longer than people renting out an apartment. There are a number of reasons for this. For instance, a tenant simply feels more at home within a single-family unit. This is also good for business because it’ll cut down the expenses of moving someone new in. Do not underestimate the expense of higher turnover – it can be bad for apartment investor profits. In an under-performing or weakening market, a multi-family complex isn’t as financially nimble as owning multiple single-family homes. Because a 10-unit apartment is not divisible, it may be difficult to move past setbacks without the ability of selling one or two of the units. Those who invest in single-family homes can sell one or two units for a much-needed capital boost. It’s not too often that people will discuss this, but pests can be a HUGE problem, but even bigger in an apartment complex. If a tenant within a multi-family complex allows pests to become an issue, chances are that it’ll spread to other units and compound the cost to fix it. It’s also bad for business when the units you own are known pests or rodent issues. In a single-family home, the price to get rid of pest or rodents can be lower because it is more contained and not as visible. We already discussed extra costs for maintaining a multi-family complex. And many are surprised to learn that the cost for financing single-family residences is lower. When investors decide to use those homes to bring in income, they may pay lower mortgage interest rates and a lower down payment, which might to be the case with the purchase of an apartment complex. Hiring a professional management company or employee to manage your complex can be pricey. In addition, it may be easier for your professional management team to deal with single-family dwellers. As you think about your next big investment, do not ignore the DETAILS and factors of your options. 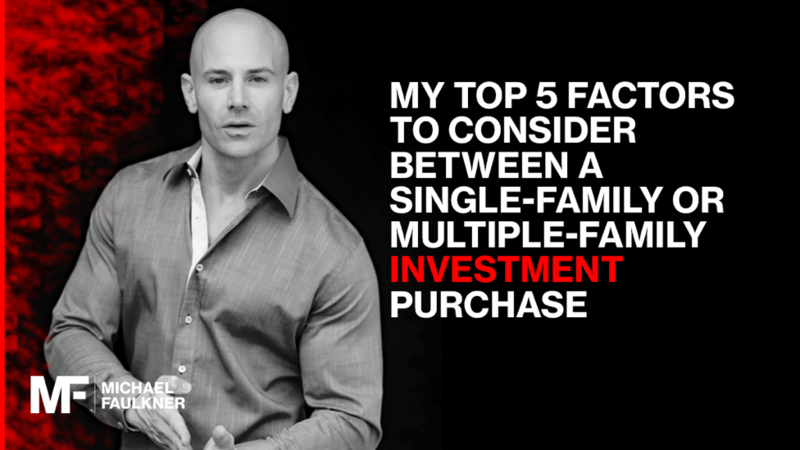 Carefully weighing these factors and understanding the pathway for your greatest return on investment will be instrumental in sustaining your real estate successes.